Image is very important to all of us especially when we are at a young age. We always want to look good and fit the beauty image of the society we live in. It is this idea of looking good and feeling good, that I started going tanning and using products that I thought would make me look better, but without knowing I developed acne at early 20s. Acne did not run in my family and none of my parents or my siblings have had acne, so I was surprised when I got it. As the most common skin disease, acne can do everything to harm a person's esteem and absolutely nothing to improve it. Creating a low self-esteem of myself and not liking my new look, I started then using expensive products and acne cleansers but nothing actually seemed to be working. I decided to leave an appointment with the dermatologist and he prescribed Tazorac Gel to me. This is how my interest for the paper started. I wanted to write about something that was meaningful to me, that applied to my daily life and I would be interested in reading. I decided therefore to write about Tazorac and how this gel that I apply every night in my face affects my skin, I wanted to know what is it made of, its mode of action and most important of all will my acne go away? The molecular formula is C12H21NO2S and it has the chemical name of Ethyl 6-[(4, 4-dimethylthiochroman-6-yl) ethynyl]nicotinate. Tazorac mostly treats whiteheads and blackheads. Whiteheads stay beneath the skin and blackheads reach the surface of the skin and they stay in the skin for a long time. Tazorac is not only used for the treatment of acne but also for treatment of psoriasis and sun damaged skin (photodamage). Tazarotene is a vitamin A-derived drug and is part of a class of drugs called retionids. Retinoids are used in the world of medicine because they regulate epithelial cell growth, cells that line the cavities and surfaces of the structures throughout the body and are important in secretion, protection, transcellular transport, etc. Retinoids help with acne because they slough off dead skin cells at a normal rate so that dead skin cells don’t bind together and clog our pores. We get acne when our oil ducts become clogged. Tazarotenic acid binds to all three members of the retinoic acid receptor (RAR) family: RARα, RARβ and RARγ but show selectivity for RARβ and RARγ and may modify gene expression. Even though we have information about Tazarotene, its mechanism of action in acne vulgaris is not very defined. However, the article “Anti-Acne Agents Attenuate FGFR2 Signal Transduction” suggested that anti-acne agents may operate by down regulation of FGFR2 signaling. FGFR2 or fibroblast growth factor receptor-2, is a protein important in processes such as cell division, regulation of cell growth and maturation, formation of blood vessels, wound healing and embryonic development. One end of this protein remains inside the cell and the other end projects from the outer surface of the cell, a way which allows FGFR2 to interact with specific growth factors outside the cell. Retinoids such as tazarotene diminish the FGFR2-promoted prolifereation, differentiation and lipogenesis. Topical retinoids reduce the number of microcomedones, the primary lesions of acne. Treatment of acne with retinoids increases proliferation of epidermal and supraseboglandular keratinocytes. The all-trans-retionic acid or atRA signal is mediated by fatty acid-binding protein 5 to peroxisome proliferator-activated receptors PPARβ and PPARδ promoting cell survival in keratinocytes. In diseases with hyperkeratinization, such as acne, the normalizing activity of retinoids is mediated by modulation of differentiation rather than cell growth. The retinoids reduce FGFR2 signaling in follicular kerationcytes and thus they normalize follicular hyperkeratinization in acne. An hypothetical synopsis of anti-acne agents targeting the FGFR2 pathway. The atRA or all-trans Retinoic Acid -show in the above picture as number 4 - induces expression of Sprouty inhibiting the MAPK cascade and induces MKP3 for de-activation of ERK, the 13cRA downregulates 5α-reductase 1 expression. As seen in this table from the two different clinical studies the percentage of people that saw 75% or more improvement was higher for those who used Tazorac 0.1% Gel than those who used the Vehicle gel. In the right columns of the table the numbers are lower by 20 people out of the 117 participants who used the vehicle gel in comparison to 40 people out of 105 that used Tazorac. Tazorac gel seems to improve acne vulgaris but at the same time it has some adverse reactions. Some of the most frequent side effects reported by the people who used Tazorac 0.1% Gel in the two studies above were desquamation (a gradual peeling of the face), burning of the skin right after Tazorac was applied, dry skin, erythema (redness of the skin) and pruritus (itching). Some of these side effects are the same ones that I experienced. In the first 4 weeks of using Tazorac I would get a lot of burning and itching, which also lead to redness of my face. In the morning my skin would be very dry and every time I washed my skin it would peal. After, using Tazorac for almost 5 weeks now, I definitely see an improvement but at the same time my skin itches even thought not as frequently as it did before. Also, my face looks very red and if I exercise or do some heavy duties my skin gets a reddish blush, way more than it used to get before. Now, I am at a stage where some of my whiteheads, this is the type of acne I have, are starting to come out. Also, my skin looks much rejuvenated compared to what it was before. Apparently this is because Tazorac is also used in helping with the wrinkles and other skin diseases such as psoriasis. I would not say that I am completely satisfied with Tazorac because even though I have seen some results there have been some other side effects that are not very pleasant, such as the ones I mentioned above. Most of the studies that are done using Tazorac recommend using the product for up to 12 weeks because that is when most people have seen remarkable results. In the first weeks I saw worsening of my acne vulgaris and since that happens to a lot of people most of them discontinue to use the product, but the key is to keep using it because with every acne product before your skin gets better, it first gets worse. I am still in a phase of improvement but now it has been almost 8 weeks since I started using Tazorac. I have definitely noticed an improvement of my acne but it is not completely gone. The side effects that I was exposed before are diminishing and that might be because my face is now used to Tazorac. I hope that soon I can see major improvements and if so, I would love to recommend it to other people that suffer from acne and have that low self-esteem of their image. 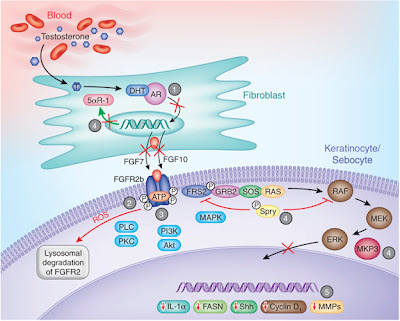 Ahmed Z, Schuller AC, Suhling K, Tregidko C, Ladbury JE (2008) Extracellular point mutations in FGFR2 elicit unexpected changes in intracellular signalling. Biochemistry Journal 413:37–49. Melik C. Bodo, Schmitz Gerd, Zouboulis Christos, (2009) Anti-Acne Agents Attenuate FGFR2 Signal Transduction in Acne. Journal of Investigative Dermatology. Online Article. Tazorac Drug Inforamtion. RxList-The Internet Drug Index. WebMD 2012. I would be interested to see a follow up of your final results after your personal experience of the 12 week trial. I find it interesting to learn that these medications do more to improve incoming skin as opposed to treating current acne that has already developed.